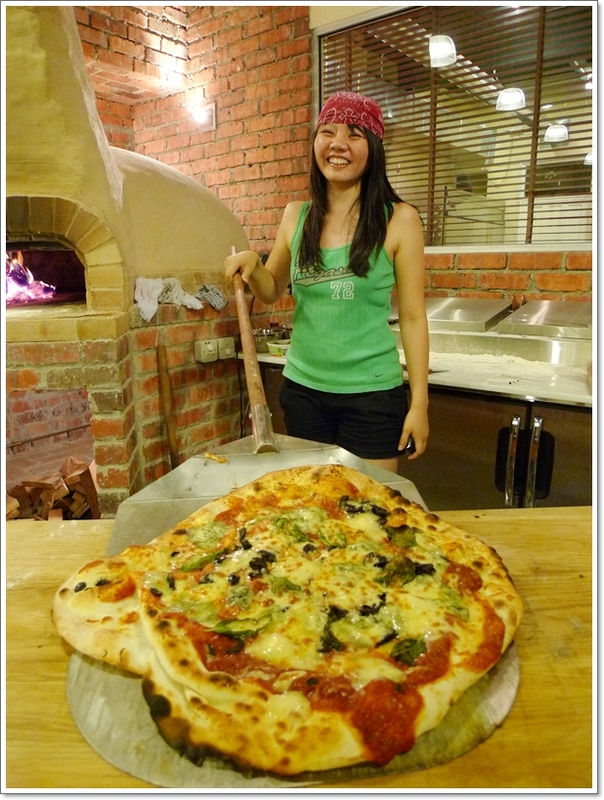 Craving for some REAL Pizzas? Yeah, that should be Michelangelo’s, spelled differently. But who cares right? In his most joyous, devil-may-care attitude, I doubt Michael himself mind had I spelled his restaurant the other way ’round! 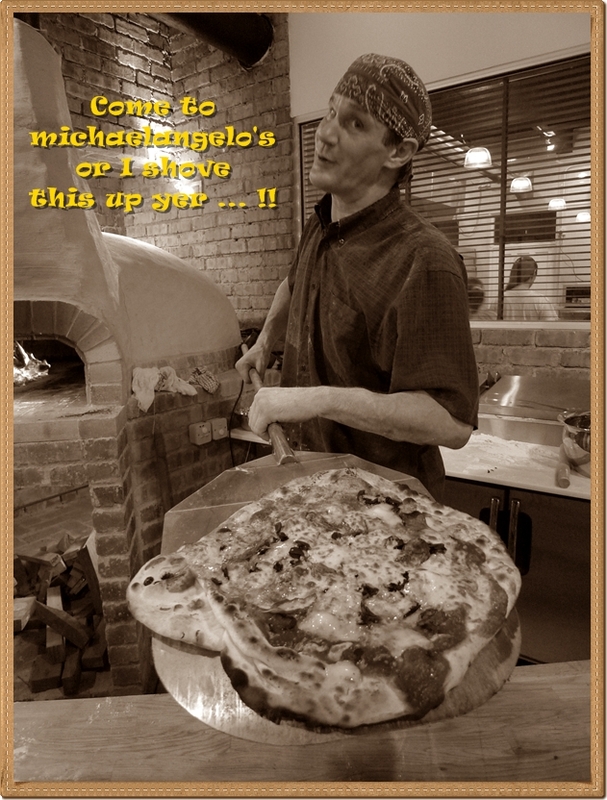 Yet to officially open for business, Michelangelo’s Pizzeria is expected to be up and running in a week or two’s time. Hopefully by Christmas, or prior to that. 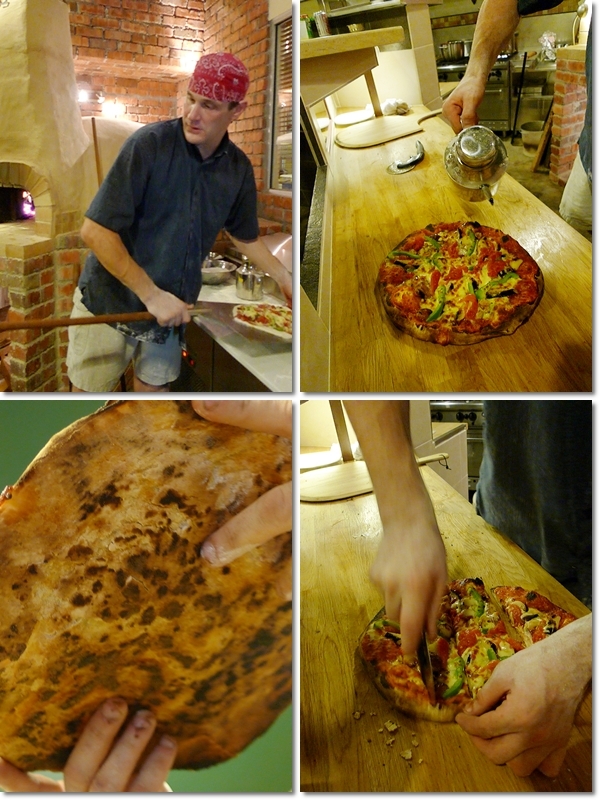 To appease that craving for some good ol’ REAL quality pizzas, in Michael’s own words, you must try Michelangelo’s painstakingly stretched, tossed, or rolled pizza dough from good quality flour (no idea what the name was, sorry), topped with the freshest and best of ingredients. No frozen sausages, generic pepperoni/salami, nor minuscule layers of mozzarella. Having a whale of a time himself stretching them flat on the working counter, tossing them with much gusto and liberally throwing on ingredients as he desired …. Now that’s unorthodox. 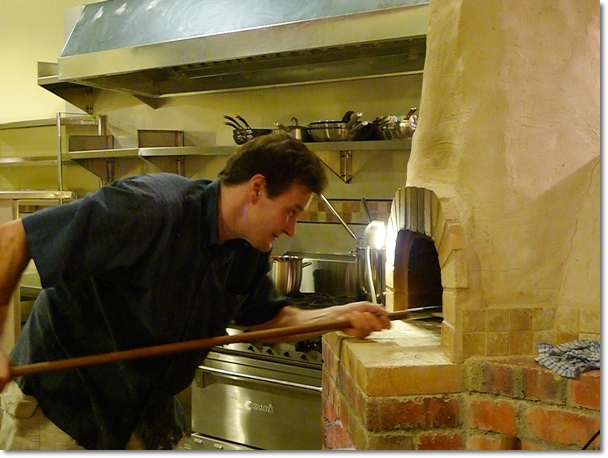 The specially built firebrick oven (Michael, whatcha call this again?) for the pizzas, withstanding the astoundingly high degrees of heat, from the fire woods … no gas, no electric ovens please. The pizzas go into the burning igloo-like structure, trapping heat from within. 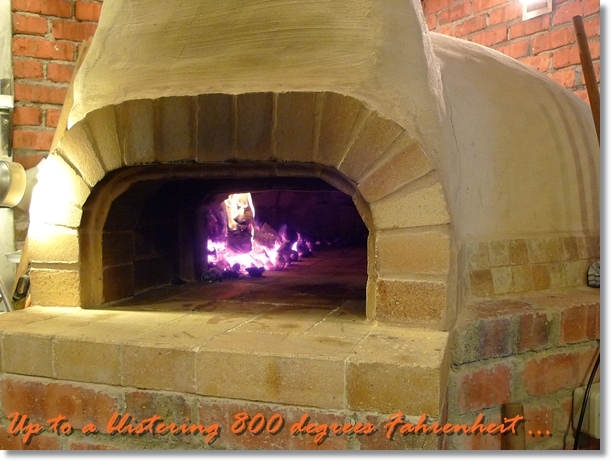 The walls stay hot for hours after the pizzas are done, but need to be primed few hours earlier, to reach the desired degrees of heat. 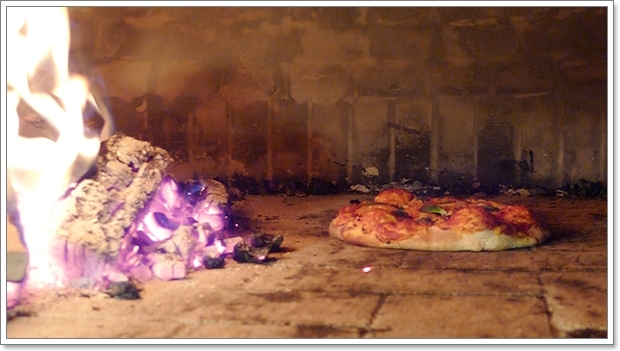 Within minutes, the dough would be raised to perfection and burnt to the right degree. 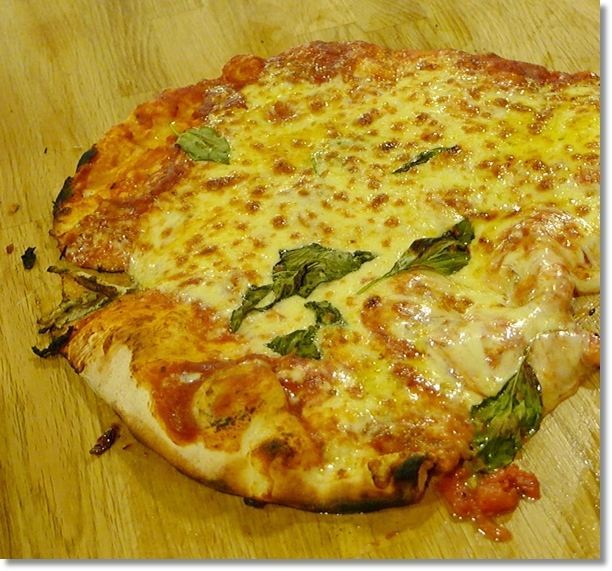 Yeah, so you know you do not have to wait for aeons for your pizzas to be served. 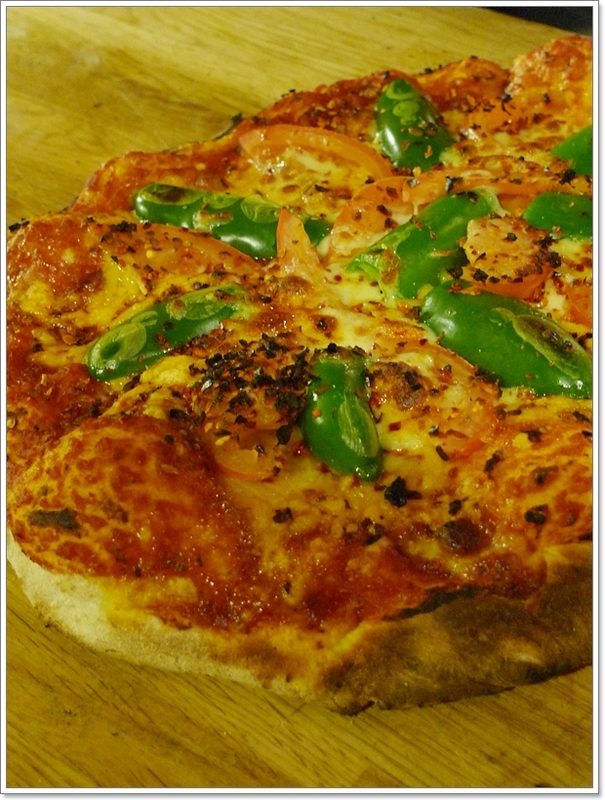 Drizzle some olive oil, the charred bottoms of the pizza, and slicing them in a jiffy. Who cares bout perfectly squared, or portioned slices of pizzas?! Thanks to Michael and Siew Li for the kind invitation to hang around the still barren restaurant, and watch the chef himself in action. 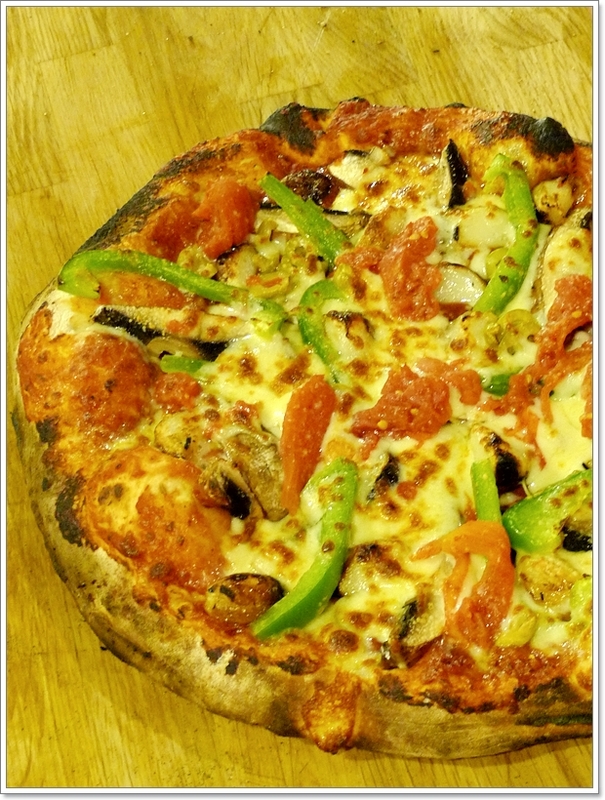 With possibly no plans in mind, he magically did everything from scratch and made several pizzas with various combination of toppings, from the scrumptious pork/beef pepperoni and cheese to roasted garlic and portobello mushrooms, and jalapeno peppers to plain cheese and basil. 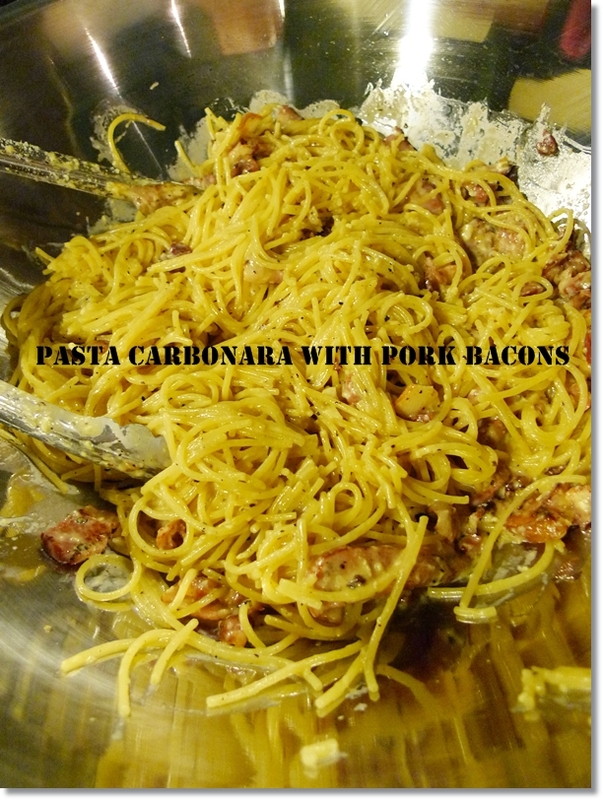 The myriad of combination is endless, and limited to only the diner’s preference. But of course, not all combination would be inserted into their final menu, which by the way, would be revamped periodically. Heck, there’s not even a need for a rigid menu, for you can request for the weekly specials, or mix-n-match the toppings as you seem fit. 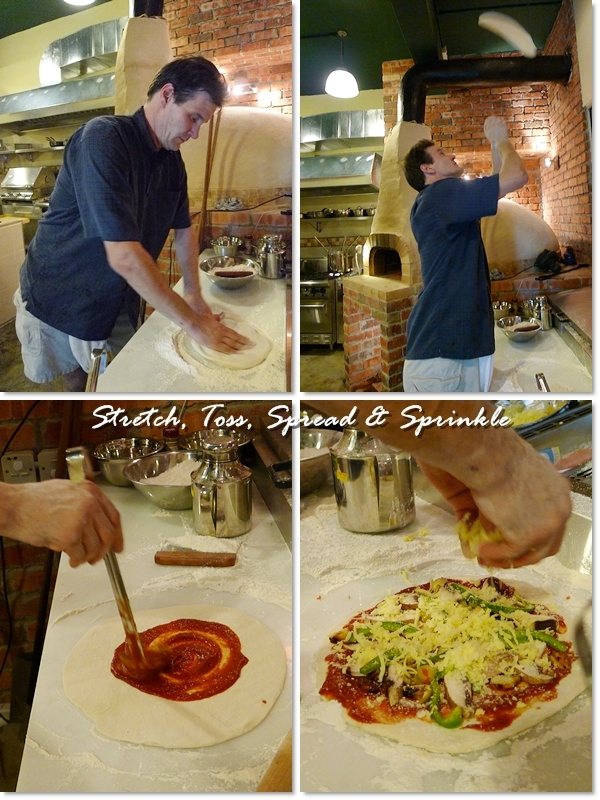 Just convey your cravings to Michael, sit back and watch him perform his magic with the almighty oven. 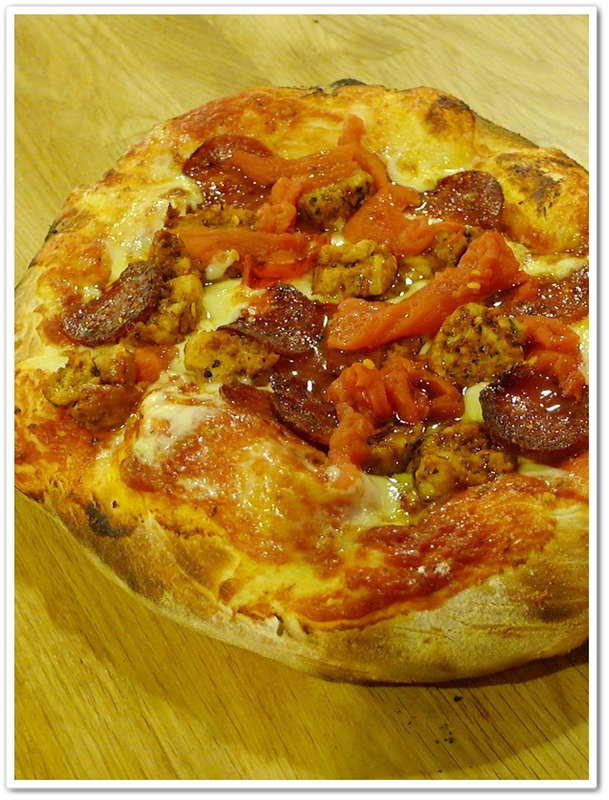 Business Hours : 6pm – 10.30pm daily, closed on Mondays. Plans to open for lunch soon. A classmate recommended me to look at this post, great post, interesting read… keep up the good work! Page looks fine in Firefox but looks really weird with broken images on my Mac that’s running NetSurf – Otherwise, really great blog theme. The food looks delicious.. I keep looking for their prices online but get no result..
Any reason why prices are not stated? You can see the prices at the restaurant itself. They do have printed menus, but change periodically. I went there at 8.45pm and was dissapointed at one of the Indian waiter’s manners. There were 2 four seater tables and 1 for a 2 seater available. The 2 seater table was push right to the wall and patrons were seated so close that its not possible for me to squeeze in my legs and the other empty table with the corners touching this table which I am supposed to be seated. I asked this Indian waiter if we may be seated in this other table instead but was told that was meant for 4 people and I ask him how can I sit in that teeny weeny space. He then sarcastically replied and pointed to me ONE sit here and ONE sit there. We then left feeling dissapointed and angry. I am sorry you had such a terrible experience at our establishment. However if you were seated at one of the three corner tables, our staff was correct in seating 5 people there. We have been opened for business for about 2.5 years now and have literally sat hundreds of tables of 5 at those tables. If however it is a very slow night or right after opening or before closing and we are not crowded we can then join the two tables together. While I fully understand your complaint, we do take into consideration family size, the actual size of people and if it is too tight we will then join two tables. However more times than not there is room (yes it is slightly tight) for 5 people but some still want more room. While we would love to be able to accommodate everyone, we simply cannot. We have very limited seating and we need to move tables during rush hours in order to turn a profit which in truth is part of the reason we are in business. Therefore we do need to manage our tables. While the “majority’ of our customers are understanding and satisfied with that, there are some that do not or will not understand. All we can do is apologize and hope they can understand, but we are not always able to please everyone every time. As for the place being American and the “so called American Boss” we all I can say is I was born and raised in America from 1967 until I graduated university and am living in Malaysia now since 1999. Our place if based off a a Chicago concept of a neighborhood pizzeria, not a upper-scale family restaurant., We are a fast food establishment and do try to give everyone a good and happy time there. We do thank you for your comment however and as always will consider what you have posted and will hope that one day you will stop back in and try to please you again later, you may also ask for me anytime you wish and I’ll make sure that staff lets me know so I can meet with you and try to please your experience there if you ever do choose to come back.